The obvious question is what draws evangelicals to more liturgical traditions—and why? For people in some of those traditions, the answer is clear to them—they have found the true (or at least truer) church. However, I think there are other factors at work, including the reality that many evangelicals struggle with the simplicity of evangelicalism, its lack of historic rooting, and more. I’m always a little leery of pieces that try to draw out what people really are thinking when they convert to Orthodoxy (or anything else, really) rather than simply listening to the reasons given by the convert. That said, Stetzer’s piece provides some food for thought, but, as we shall see, stops short again and again of actually giving some foundations for his criticisms. He gives four reasons, along with four ways how Evangelicals might respond. So let’s look at each. Why do People Convert to Orthodoxy? These theologically-interested believers often grow weary of two things: a lack of liturgy that ties us to our past and, for some (particularly those prone toward Orthodoxy and Catholicism), the need for a source of authoritative truth that is lacking in evangelicalism. Yet many more intellectually-inclined evangelicals often struggle with the simplicity of evangelicalism. As a missiologist, my approach is, perhaps, simpler still—the ideas I (and many missiologists) advocate teach that the “how” of some parts of worship are shaped by the who, when, and where of culture. This idea is almost offensive to some, and some who reject those ideas go down other, narrower, older paths. As such, moving to these traditions for liturgy that ties to the practices and expressions of the early church does make sense. In many ways, they find exactly what they are looking for. This mainly dodges the problem. It is true that there are intellectual Evangelicals, so you don’t have to become Orthodox to be a Christian intellectual. But Stetzer doesn’t discuss what it is about Orthodoxy that makes it attractive to intellectuals. Liturgy isn’t enough to explain the draw, and it certainly isn’t only for intellectuals. Most Orthodox aren’t intellectuals. What Orthodoxy does have, however, is a robust intellectual tradition that isn’t just liturgical, but dogmatic, theological, pastoral, trans-cultural, philosophical, missiological, etc. There really is a difference between a Church that has been doing these things for 2,000 years across cultures as diverse as Georgians, Arabs, Romanians and Greeks and a loose theological movement that finds its origins in the emotional conversionism of 19th c. revivalism. The reason why Evangelicalism has an intellectual problem is because its basic DNA at least strongly hints that anti-intellectualism might be more spiritual. Here’s a question I’d like him to answer: If the early Church was eucharistic and liturgical, and if Christians kept being that way for centuries in numerous cultures, languages, etc., then why should we conclude that that kind of worship is merely a “cultural form”? Historically, almost all Christians have been liturgical. Even today, the majority of Christians are liturgical. So why is it that the comparatively parochial phenomenon of revivalist church services relativizes liturgical worship to make it merely “cultural”? And if the Eucharist really is the Body and Blood of Christ, how can that ever be “cultural”? And if it’s not really His Body and Blood, we’re talking about questions of heresy, not merely culture. Stetzer wants both to affirm early Christian liturgy and also relativize it. But you can’t really have it both ways. Either the way the Apostles taught their disciples to worship (and was subsequently passed down almost universally for centuries) is authoritative or it’s wrong. It’s not just good for a certain time and place. If it were, it wouldn’t be the only mode of corporate worship ever mentioned in Scripture, both Old and New Testaments. And we also have to imagine that the Epistle to the Hebrews would look really different if liturgy wasn’t intended as the worship norm. And what about the worship we see in Heaven? Is that just a cultural form? …the evangelical bent towards Western individualism has opened the door to an ‘every Bible for itself’ mentality where, combined with the digital age, rogue armchair theologians can be equipped with major influence without proper ecclesiological accountability. It’s a bit of a “me version” world of Bible translation. Lacking a central definition and protection of truth can cause (and has caused) much of evangelicalism’s problems. As an Orthodox Christian, I will certainly acknowledge that interpreting Scripture isn’t always easy or obvious. If someone becomes Orthodox thinking that, he will be disappointed. But what is different from Evangelicalism is that there actually are boundaries for the Orthodox, and there is a community that has authority that can make rulings. There is an interpretive tradition to be responsible to. For Evangelicals, anything from their (or another) tradition that they might use in interpretation is at best a resource. It does not really have a hold over them except within certain denominational cases, such as confessional Lutherans, etc., though that just raises the question of why that tradition is more authoritative than the tradition they broke from historically. And even if they break from their denomination over hermeneutics, it is unlikely that anyone would see that as truly critical. You can always start your own. And that’s in keeping with the Evangelical movement, too. People are drawn to these traditions for good reasons. Low church approaches have problems that we need to be willing to address. But I see many conversions to such traditions as a search for the denominational grail. People are trying to find the way back to the practices of the early church, and all claim to have the roadmap to get there. It is a common thing for denominations to trace themselves back to the earliest models of church. Baptists did this through the trail of blood and baptismal practices. The Restoration Movement (which includes Churches of Christ) values restoring the New Testament church. Some Anglicans and Lutherans attempt to trace their roots through apostolic succession. The Eastern Orthodox Church traces their Patriarch of Constantinople to the Apostle Andrew. In reality, no one has it completely right and all such attempts have issues. He unfortunately doesn’t mention that apostolic succession was the early Church’s way of proving that something came from the Apostles. He also doesn’t mention that Orthodox apostolic succession doesn’t depend on Constantinopolitan claims about St. Andrew. Those claims might be dubious, but no one questions, for instance, the Petrine origins of the Churches of Antioch or Alexandria nor the apostolic origin of the Church of Jerusalem, etc. Comparing those churches’ historical succession to Baptist Landmarkism, which is essentially an attempt to trace anti-Catholicism through a long succession of various heretics, is really a stretch. And comparing it to Restorationism is almost a non sequitur. It’s not a quest for a “denominational grail.” History really does record a continuous succession of bishops and their flocks in various ancient apostolic sees, most of which are still occupied by Orthodox bishops. And to conclude that “no one has it completely right” basically means that you can never really know if what you teach and practice aligns with what Jesus taught His disciples or not. Agnosticism about church authority means that you really aren’t accountable to anyone, because, hey, no one has it completely right. 1. Acknowledge we see through a glass darkly. I will certainly agree with Stetzer that “We do not see all that God is doing in the world, and we certainly don’t determine who is or isn’t a follower of Jesus.” But we can still say some things about what it means to be a follower of Jesus based on what Jesus taught and how those who followed Him and followed His disciples understood it. I’m also glad that he “still can acknowledge that [his] own tradition needs to be reevaluated in light of scripture and, yes, the practices of the early church.” But here’s the catch: Whose interpretation of Scripture? And what exactly from the early Church is going to become authoritative for him? I myself let my views on Christianity be evaluated in that light, and the conclusion I came to is that I had to change because I didn’t align with the early Church. Stetzer doesn’t agree because early Church forms are merely cultural, so how does he succeed in not making himself the one doing the evaluating rather than being the one evaluated? 2. Don’t normalize cultural church forms. I’m not moving toward Eastern Orthodoxy, so let me add why. For one, I think the tendency towards (big-O) Orthodoxy and its liturgy is missiologically unhealthy, not just theologically problematic. Many segments of Orthodoxy take Hellenistic (or other) cultural forms, consider them normative to today’s context, and apply them as the “true” or “authentic” way. If liturgy is what he has in mind, of course culture has affected liturgy throughout time. No one who has studied liturgical history denies that. But overall, the theme is continuity rather than innovation. And the shape is still liturgical. Until the past couple of centuries, there was no culture that Christianity encountered and concluded that it was liturgy itself that had to go. And even now, that conclusion is reached by only a minority of Christians in certain places. That said, if worship is not only culturally conditioned but actually a cultural (and therefore relative) product, then what else that is normative in the early Church might be thus relativized? The canon of Scripture? The dogmas of the Trinity and Incarnation? We’re not talking about questions of propriety and discipline such as head coverings or whether we call our local leader a bishop or presbyter, nor about always-difficult issues like what 1 Cor. 15:29 means for baptism. We’re talking about the very heart of Christian life—worship. And we’re talking about taking a long-term historical commitment to liturgy and saying that it really doesn’t apply any more. That’s not helpful and it actually hinders the advance of the gospel, which in part explains why American Orthodoxy has far more converts from evangelicalism than it does from secularism. Actually, I don’t think it does. First, he should probably mention that almost no Christian group in America has more converts from secularism than from other Christian groups. Religious belief has remained basically steady for decades in the US. Almost all conversion growth is ultimately transfer growth. Now, one may ask why it is that there are more Evangelical converts than other kinds in American Orthodoxy (which I’m not sure of, actually, and have never seen statistics on), and I’d suggest that that is simply because of the kind of people who have made it their mission to reach out with the Gospel as Orthodoxy sees it. It’s not as though Evangelicals are more likely to become convinced that “cultural forms” should be made absolute and therefore convert to Orthodoxy. Overall, I don’t think most Christian groups of any kind really know how to convert people from secularism yet. Most people becoming Evangelicals, for instance, are usually just trading in older denominational affiliations for something more “contemporary” or need-based. This, then, exports the truth of scripture to our modern context. But it just skips the problems of sola scriptura entirely. Okay, “export.” But which “exporter” will you use? Why should Rob Bell’s hermeneutic be less authoritative than John MacArthur’s? They both certainly claim to be applying Scripture to the current generation. In any event, that’s not what sola scriptura is. That’s just doing what Christians have always done—read the Bible and apply it. The problem is whose reading you’re going to use. Perhaps the 500th anniversary of the Reformation is a good time to remember the value of Sola Fide, Sola Gratia, Solo Christo, and Sola Deo Gloria as signposts for our unique expression of the gospel that goes deeper than tradition. In fact, it brings us to principles which are expressed in different cultural languages using different cultural methods. This is hard to read as meaning much more than “So remember to be Protestant.” It’s also not going “deeper than tradition.” Those five Solas are a tradition. They’re neither. They are a specific hermeneutic developed within the Reformation. The question is whether you buy into the Reformation’s hermeneutic tradition and why you believe it’s more authoritative than what came before. 4. Stay with the message. We want to lovingly and graciously acknowledge that others will follow Hanegraaff and swim the Tiber or swim the Bosporus, but ultimately we are reminded that evangelicalism is a movement based on scripture sought to be lived out in a context. And that’s its most basic problem. It’s not the Church. It’s not even a church. It’s a movement. And it fails to acknowledge where Scripture itself came from. The followers of Jesus weren’t “a movement based on scripture sought to be lived out in a context.” They were the Church. I’d say the simple words that undergird evangelicalism: Let’s follow Jesus, keep sharing the simple gospel, focus on the Bible, and think like missionaries in order to translate that truth to our modern context. But even if you define “orthodox” by the classic definition of orthodoxy, i.e., the Nicene Creed, that really isn’t what the Gospel is. The Gospel is indeed following Jesus, focusing on the Bible, and thinking like missionaries, but it’s also about baptizing and making disciples of all nations, teaching them to observe all that Jesus commanded. It’s about bringing the world into the Church. And that’s something Evangelicalism isn’t even trying to be. So long as it’s a movement, it can’t be the Church or even a church. My point here isn’t to make hash of Stetzer’s piece. I get what he needs to do here, which is to reassert Evangelical identity in the face of conversions away from Evangelicalism. He’s right that there aren’t many, and Orthodox who get triumphalistic about conversions really just don’t know the numbers well and are probably being jerks. Why is my interpretation of the Bible correct? What right do I have to do doctrine and worship so differently from the disciples of the Apostles? Why did almost no one interpret the Bible the way the Reformers did prior to the Reformation? What did the disciples of the Apostles say about how they believed and worshiped? How did we get the Bible we have today? Why does my Bible have fewer books than the Orthodox Bible? Why is the high view of Scripture I hold as an Evangelical only barely reflected in my worship? Is there a church that truly saturates the worshiper in Scripture? Why are liturgical worship and episcopal government the norm for almost all Christians for 2,000 years? What is the Church? Does it have binding authority? Can it be located? Those questions are just a beginning, but answering them would go much further in terms of figuring out why some Evangelicals become Orthodox and why Stetzer’s answers aren’t likely to make them change their minds. The Orthodox liturgy is God’s liturgy is God’s liturgy. It’s the most adaptable liturgy ever. It can be celebrated in a tiny house if necessary or a shopping mart if necessary as long as the space has been consecrated and the altar faces east. I have seen Orthodox priests in the blogosphere who serve at a mission in which property is shared with whatever. I’m not Orthodox but High Anglican. The points you make are correct though. People come to Orthodoxy because it is the Tradition of the Christians that they have encountered and they no longer want a cheap counter-feit version of the Christian faith. They’ve had the CNN version of the Good News forever and they want to know and experience the real Good News. Great example. I’ll add something like that. I am a former Southern Baptist pastor (Stetzer’s affiliation) that will be made a Catechumen in the Orthodox Church this Sunday. While I have never been a fan of many of Stetzer’s analyses of culture, I find this one especially disheartening. My reasons for coming to the Orthodox Church are not as simple as he would like to make them. Although academic study brought me to the door, it was the invitation to come as a pauper that brought me inside. When I attended Liturgy for the first time I noticed all of the things converts mention. It was beautiful, vivid, mystical, and alive. Yet, as special and right as all of this seemed, the centrality of my conversion was much deeper. There, as I watched faithful Orthodox venerate the cross, I discovered something that years of time in Evangelicalism had failed to solidify in my being. I discovered that Christ’s cross was an act of love for me. All of my life I had equated the cross with the frustration and ever-present wrath of God. The cross was where God “cleaned up my mess.” He showed up, paid my fine and the Father would never let me live it down. The Penal Substitution Theory, coupled with a dysfunctional church-upbringing made me the object of a form of grace, but never His love. Orthodoxy removed all of that and replaced it with the ancient truth of Christ’s victory on the cross. For the first time I knew that God loved me. For the first time I began a real, true healing through conversion. Orthodoxy gave me life. Truth be told, Orthodoxy has saved my life through the power of God that is held within. That is why I am converting. Evangelicals can never understand this aspect of conversion. They see the Orthodox Church as just another denomination or option. The idea of the One, Holy, Catholic and Apostolic Orthodox Church is alien to their worldview. They will always look for the “hook” in conversions to Orthodoxy (although they don’t exist). When they think they have found it, they will try their best to reproduce it in their own congregations. This is their modus operandi. They have to continually reconstruct themselves to keep the protests alive. It is really a sad existence. Anyway… Glory to God! Christ is Risen! God grant you many years, Larry! You absolutely nailed it. I came to faith in the baptist church and have been in the PCA for 25 years (a 1/3 of which I was an RE and music director) and I ultimately never found what I really needed most, healing. Protestantism and especially Evangelicalism spoke often of being transformed by the Gospel but never gave me the tools by which to do so. Within Orthodoxy I find the means by which I can put on Christ in a daily basis. It helps me deny myself so I can become less and Christ can become more. I am still a catechumen and hope very soon to be received into the Church. What a beautiful testimony! Thanks for sharing this! Welcome home brother! I love what you wrote and agree. I was all my bible study that brought me into the Orthodox Church…the FULNESS of the FAITH of Jesus Christ! Plus a huge push by my ever wise husband! Beautiful words! It is all about love. Yes. Amen. This was something I knew as a child in my Methodist Sunday school and reading C.S. Lewis’ Narnia series, but which I lost when I moved into Evangelicalism in my teens where Penal Substitution theory predominates. Eventually PSA destroyed my capacity to love and trust “God.” Thank God the Holy Spirit guided me out of that impasse into Holy Orthodoxy. I just passed my tenth anniversary as an Orthodox believer, and I have never looked back. Here Christ in all the fullness of His love can be clearly seen. Now I have a vision of the gospel truly worth sharing! The Greek word προσκύνησις (translated as worship) is derived from the verb προσκυνέω, proskyneo, itself formed from the compound words πρός, pros (towards) and κυνέω, kyneo ([I] kiss). Hence to worship is to kiss towards God; an act of love first and foremost! A charitable but direct response. Thank you. I might add with respect to the “cultural” elements (those that are actually cultural and not universal), that it is important to embrace some human particularity, some linguistic and stylistic idiosyncrasy. We must let our countries and cultures breath, while recognizing that the faith is bigger than them. A homogeneous, a-cultural faith scrubbed of the stains and streaks it has accumulated through long centuries of turmoil and blessing would be very bland to say the least; indeed, such a conception is itself a culturally rooted impulse–an assumption arising from the culture of western Protestantism that clings to what is “merely” or “simply” or “minimally” essential. It is a church of the Lowest Common Denominator. Thanks. I saw this article and my “gut reaction” was much the same as what you have recorded here — especially the excuse — that’s all it is, really — about ‘cultural forms’. That said, I, for one, am glad that he, an educated evangelical, wrote this piece because it seems to me to provide the basis of evangelizing the evangelicals more efficiently (for lack of a better word). For instance, one thing about his response and attempt at explaining why serious evangelicals are embracing Orthodoxy is the unspoken and underlying Nestorianism of the evangelical milieu. This unspoken Nestorianism is behind the real sacramental deficit which lurks in most all protestant theology. God comes close enough to pay a debt, bestow some grace or grant forgiveness, but not nearly close enough to be born of a virgin or to suffer in the flesh. I’ve heard this charge of Nestorian brought against evangelicalism before, but I’ve never quite understood it. What is the rationale? For what it’s worth, when I finally “got” this, I knew that there was no home anywhere in protestantism because exactly here, protestants are largely heretics and I don’t use that term lightly or with intent to insult. No can speak for the Evangelical Protestant community precisely because has no hierarchy. Chuck Smith, pastor of Calvary Chapel, Costa Mesa was first teacher. That is what he taught us in 1981 and no teacher that I have had since has differed. One of the things Chuck said about Mary is that protestants have probably gone too far in reaction the marianist’s co-redemptrix doctrin found in the Roman Catholic church. He said that she was the chosen vessel to bear the Messiah and we should treat her with more respect. Let’s set aside the hubris in using “King of Righteousness” as a nom de plum. As one who 31 years an Evangelical committed to understanding the scripture before being led of the spirit to a Greek Orthodox mission church, you do a grave injustice when you associate Nestorian as a common underpinning of Evangelical theology. That’s not a pen name. He is Archbishop Melchisedek of Pittsburgh, a diocesan​ bishop of the OCA. My apology to both you and his Eminence on that misunderstanding. However, to assume that the evangelical Christians are followers of a heretic is still insulting. That’s not what His Eminence said, though. They’re not following a heretic necessarily, but there is a theological problem in a lot of Protestantism which is reminiscent of Nestorianism, namely, the tendency to separate the physical from the divine. One sees this both in presentations of Jesus, which are often devoid of the divine (even while paying official service to His divinity), and in anti-sacramentalism and a general sense that holiness has nothing to do with physical objects. 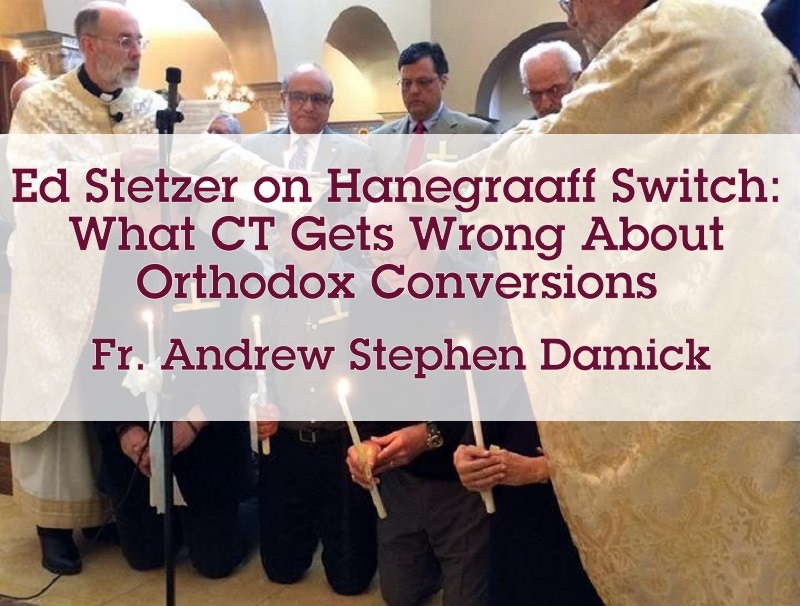 As one who was a “member” of a Pentecostal church which, in its entirety, converted to Orthodoxy over twenty years ago, would encourage Mr. Stetzer to contact one of us for a much more authentic understanding of the “whys” of conversion. FWIW, he does mention that his mother is Orthodox and that his stepfather is an Orthodox priest, so I suspect he’s done some homework on this. But I disagree with his analysis. So he’s an apostate? I’m not trying to be snarky, I’m genuinely asking. If he is, that changes things regarding where he’s coming from. Father, did you respond directly to him? Again just curious. Definitely read his article. He talks about his parents as being converts to Orthodoxy. He doesn’t mention when, but I’m guessing that it was later in life. Regarding your other question, I left a comment on the FB post made by CT. I think this goes to the point that Fr Andrew brings up and then steps away from right at the beginning–the issue of telling people what they’re “really” doing when they convert etc. Frankly, I suspect that anyone who might listen to your community’s reasons for converting and believe that they are the real reasons would very likely end up on the path to conversion themselves. People’s explanations for becoming Orthodox are extremely compelling in my experience. If one is committed to remaining Evangelical (or whatever) one is nearly forced to conclude that something else is “really” going on. The argument about apostolic succession is a good example–an extremely well-evidenced historical fact (I don’t use the word lightly) is dismissed here as an “attempt” to find continuity. But how else can one remain in a non-apostolic community in a world where there are still genuinely apostolic churches on almost every block? The honest argument would be “I don’t care about apostolic succession” but that, of course, would be very difficult in light of its importance in the Bible. So, instead we declare that the “real” reason Orthodox, Catholics etc care so much about this is something else entirely, and that that something else is silly or moot. The convenience of knowing other people’s minds better than they do is that you can always win any argument. Mr. Kennick , I, for one, would love to hear what lead your Pentecostal congregation to convert and to which Orthodox group. Perhaps, instead of musing and drawing conclusions intellectually Stetzer would be better informed if he asked those who leave the Evangelical fold for Orthodoxy why they left. I left Evangelicalism for Orthodoxy and I know why and his article is way off base for anyone I know who has converted. I would propose that the answer to why people leave is similar to the reason that Western Christianity in general is hemorrhaging “believers” on a daily basis. Those that convert to Orthodoxy are the ones who seek to keep their faith. Isn’t there an overarching feeling, whether spoken or not, in evangelicalism, that would think of anyone going to Orthodox as being deceived? I really don’t think evangelicals trust our heavily deceived self-assessment of the whys of conversion. I would not call myself deceived. Orthodoxy did not seek me. I sought Truth. I found the legalistic machinations and disingenuous attempts to disguise what lay behind the idea of Substitutionary Atonement a false flag. The Evangelicals do not trust what I say but they are hemorrhaging members who leave the faith all together and they don’t trust them either. They may think I am deceived, but that is their problem and until they address the real issues people leave they will continue to shrink. I do agree with you that that is the general sense I get from those in the Evangelical camp. As long as that is their attitude though, they will never see the truth of why so many leave. I agree. My experience has been the opposite of deception. This was really good. As an aside, I am part of a group of a group of ministers concerned with family, life, and religious freedom issues and I took great, chortling delight in pointing out, “but of course, WE got the Bible answer man” at our meeting this past Tuesday. They finally told me to shut up :). As I read this, Fr. Herbel’s book regarding American converts to Orthodoxy spoke of a peculiarly American “anti-traditional traditionalism” that oozes from every one of Stetzer’s objections, but is finally, uncritically and (one suspects) unwittingly accepted by him as self-evident and in no need of defense. If Orthodoxy is right, there’s really not much need for missiologists to tell us how to domesticate the faith for an American suburbia, is there? I think Stetzer misreads Orthodoxy, Evangelicalism, and secularism. In all actuality, Evangelicalism is itself very secular. A wonderful article, Father. Many thanks for it! I will add to the many observations above that my own experience was one of pride struck by overwhelming humility during the Divine Liturgy. For me, as I watched, the greatest impact within the Liturgy was when our priest turned and asked forgiveness of the parish before serving. It was a literal punch in the face to all the pride I had in my “knowledge” and training in Scripture and it catapulted me towards the Church. Lord have mercy and compassion. Not one of those pastors sat me down for a heart-to-heart to find out what I was longing for and why. And this after over a quarter century of dedication, involvement, service and teaching in that exact church. So I left and didn’t look back – at all. The emotional sacrifice and toll it took on myself to enter Orthodoxy was very great. I don’t regret it for one single second. What saddens me is the toll it took on my husband – to this day – 12 years later. Why would I, in good conscience, do that to myself and to one I love for anything but the desire to worship God in Truth and become more like Him? The CT author hasn’t a clue. Thanks for this charitable response to a charitable article, father. It does seem like Stetzer is just reasserting the evangelical identity without engaging very substantively with the claims of Orthodoxy or why evangelicals convert, like arbitrarily labeling liturgical worship a “cultural form” that we can safely set aside or lumping the Orthodox claim to continuity with the early church in with the more spurious claims of Protestant denominations. The specific patterns of worship in a parish church may be “cultural forms”, but liturgical worship itself is surely not. He states the problem with sola scriptura pretty clearly in a way I can agree with, but then ignores the implications–implications which were majors drivers in my own journey to Orthodoxy. Towards the end Stetzer falls into a pattern I found frustrating as an evangelical, when he says “I believe we need to go back to scripture for each and every generation of Christians and ask, ‘What would it look like to live out this timeless scriptural faith in this time and in this place? '” or later that “evangelicalism is a movement based on scripture sought to be lived out in a context.” What I always heard from such affirmations was that the “gospel” that is the core of everything in Christianity is strictly a timeless, propositional message; we hear this message, believe it, then figure out how to apply it in our own context. (The implication is that though the gospel looked like apostolic succession, liturgical worship, and an episcopal church structure for the early church, it’s fine for it to translate to rock music and congregationalism in the present day) How arid and intellectualized this was compared to the embodied, traditioned richness of how Orthodox live and worship! The gospel is not reduced down to a “simple” form for people to do with what they will, but allowed to pervade the whole life of the Church. My goodness…when I opened my email this morning and saw this, I was floored. Hank Hanegraaff converts to Orthodoxy! I can relate to Pdn. Michael’s response, ‘but WE have the Bible Answer Man’…and in that regard, now I too need to shut up! Thank you Father for this post, and thanks to all the commentators. 2) an ever present thought that “I know Jesus Christ died for much more than what I’m seeing” 3) I absolutely did not know what I was looking for. As I was leaving, I knew one thing, I had to be in church. I understood that the Body of Christ was real. I prayed that God direct me. When I came across Orthodoxy I didn’t know what that was. I read about it, contacted a some very dear priests I heard on Ancient Faith, and finally went to a service. And that was it….Mr. Stetzer, I didn’t even know what liturgy meant. I sat in that service and all I could do was cry…words escaped me…I knew I was in a holy place and I saw worship like I never saw it before. It was like going from death to life. That was about a year ago. I was Chrismated this past Holy Saturday. My Protestant friends and family were shattered. At first I tried to explain and all that did was lead to more division. Now I just leave it alone, because I know they are not ready to understand. I will gladly answer their questions the best I can, but I will not argue. They have to come to a point similar to mine and all the other converts. Father Andrew, I’ve got to hand it to you for your ability to answer these people. Thank God for that. I still can’t get over it…Hank Hanegraaff! It’ll be interesting to see how many evangelicals will follow. He’s a brave man. Many years, Paula! Welcome home! Mr. Stetzer’s approach to the issue of evangelical conversions to Orthodoxy is an example of trying to be irenic and just coming off as confused or unserious; as opposed to the old-fashioned, direct bludgeon approach of the folks over at Pulpit & Pen or Triablogue. Part of this nicer, gentler approach is to be disarming about being evangelical, sort of an “aw shucks” contention that evangelicalism’s message is ‘simpler’ than Orthodoxy, which is after all ‘intellectual’—and thus complex. Orthodoxy is thus a rarefied endeavor for Intellectuals (a minority). I think many of the above comments by fellow converts give the lie to this. Having spent my first three decades as an evangelical (for which I am eternally grateful), and having now been Orthodox for nearly a quarter century, the contrast of a simple evangelicalism to a complex Orthodoxy is to have matters backwards: The studied simplicity of conservative, especially revivalistic, Protestantism masks a deep-seated sense of superiority towards Orthodoxy, which is, in this account, a crypto-pagan peasant religion that is mixed up with…matter. Evangelicals do not dismiss Orthodoxy (to the extent it enters their field of vision) because it is too complex or intellectual, but instead because they are too sophisticated for it. The underlying, unexamined commitments of evangelicals, American cultural baggage that is invisible to Mr. Stetzer: nominalism, zwinglianism, iconoclasm, pragmatism, utilitarianism, and the cult of Progress; have long been the hallmarks of what it means to be sophisticated in modernity, to have “come of age.” In this milieu, the praxis of the Church, Her Holy Mysteries, Icons, the rhythm of feasting and fasting, are crutches for the weak or deluded, or so much folderol that obstructs pure ‘spiritual’ religion. My parish priest recently made the observation, that regardless of the problems of grown-up Protestants who visit our church and witness a liturgy, it is their toddlers and young children who immediately seem to get it! Thank you Father for a great article! I liked Fr. Andrew’s response. It was thoughtful. Some Evangelicals care about the early Christian traditions and church fathers, but those Evangelicals filter them through a modern Evangelical prism. So when a church father like Ignatius explains that the Eucharist is Christ’s body and that some heretics deny this, the Evangelical response is to deny that the Eucharist is Christ’s body and to say that Ignatius means that the Eucharist represents Christ’s body. Instead of taking the Church father in the plain meaning, they refilter it their own way. Converts like Hank stopped doing the filtering. In the West, Eastern Orthodoxy is more militant than in the East. In Romania, for instance, Orthodoxy is the more or less real faith of over 80 percent of the country’s citizens, so – to me, as an Protestant believer of Evangelical Baptist confession – Orthodoxy is not exactly the kind of faith you want to adhere to regardless of its history, liturgy, and complexity. In other words, the mistakes Eastern Orthodoxy makes in the East are considerably fewer in the West where Eastern Orthodoxy believers are only a minority. And as it has always been the case, most minorities tend to be quite affirmative of their tenets, a feature of Eastern Orthodoxy which I have seen all over the place in the West. Having said that, despite my Protestant Evangelical and Baptist credentials, I do believe that Eastern Orthodoxy is a – say – valid branch/confession of the Christian church, a true manifestation of the multifaceted body of Christ as it exists in the world. So I fall along a different line, I suppose. I was raised Baptist in an overwhelmingly Catholic region of America. I was taught a deep distrust of Catholicism, which stemmed from the pastor never really understanding it. I graduated college later in life, with a degree in Religion / Biblical Studies. 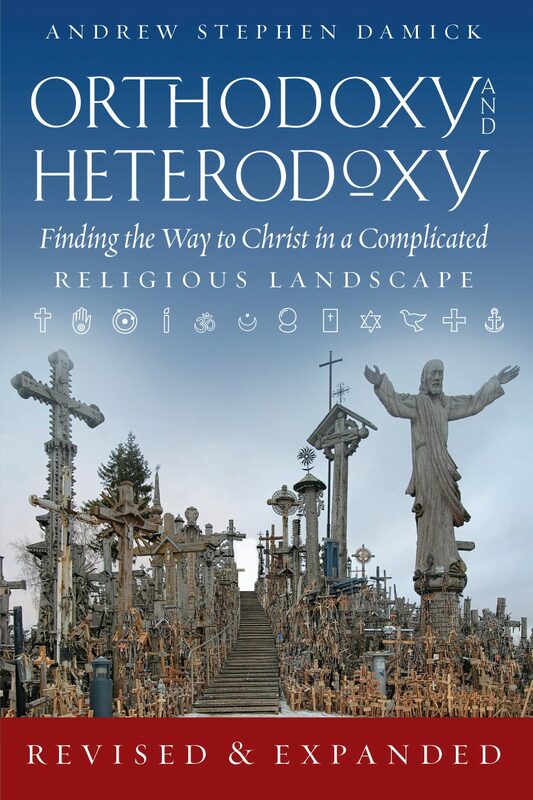 (From Stetzer’s alma mater, Liberty University) Through the years, I have gravitated toward Orthodoxy as a form of corporate worship, (although I have never converted and doubt I ever will) because I have watched as the Evangelical Churches -desperate to be popular with everyone- have moved more and more from tradition and orthodoxy, and more toward “Jesus-ifying” modern culture. The worship songs grew more and more pathetic, the order of service was less and less solemn, the whole thing feels like a rock concert. Stetzer is a huge proponent of satellite churches where the local body meets in movie theaters and the head pastor’s message is live streamed to the local campuses and they never do buy a building or form a real body. They are one step from just having “church” in their home, gathered around their computer. There is nothing sacred, or holy, or solemn about it. There is no eye-to-eye contact with other believers, no pastor standing before his congregation, delivering his homily. It’s a show, in a movie theatre, that they rent. Stetzer cannot bring himself to admit that his model is a failure, and in a broader sense, most Evangelical pastors cannot bring themselves to admit that altering the core of their doctrine based on attendance numbers and polling data is NOT working. Just as my Catholic / Orthodox brothers and sisters surely bristle when they hear “old school” Fundamentalists decrying Catholicism based on things they don’t even grasp, so I too bristle when I hear Catholic / Orthodox claims that they are the only “real, true” Church. The Baptist church of my youth (I am 53) was a right blend for me. Traditional, Heirarchical, Academic, Authoritative. In fact they were too authoritative for a period. I can’t make the leap to Orthodoxy because of the lack of a personal nature to the liturgy. But I also accept that, this issue could just be my personality, and I don’t attribute it to a basic fault with the form. Stetzer gets it very wrong, and what is amazing to me is that “The Bible Answer Man” was just fine as long as he was verifying Stetzer’s take on issues. Now that he has stepped over the line, he suddenly doesn’t understand scripture and he’s destined to fail. I’ve read sons of replies here which have only strengthened my veneration of St. Seraphim of Sarov who once wrote…..”I’ve never had to repent for silence”. I thoroughly enjoyed this conversation. I find it difficult to believe that the main thing that the triumph of the Kingdom of God on earth is awaiting is the conversion of believers of all stripes to Orthodoxy. That event could be a long time coming, at the least. But if the Kingdom is not dependent on that event, but it is coming (and the New Testament seems to indicate that it is), then why the emphasis on how Orthodoxy is the only true path to God? Nevertheless, I do truly believe that the Kingdom advances when we acknowledge that Protestants have much to learn from Orthodoxy and Catholicism. And vice versa. After all, the Protestants left the Catholic Church for real reasons…like, being forbidden to read the Bible for themselves. And having to pay clerics money if they wanted forgiveness for their sins. If even a few of Luther’s Theses have any validity, then the Protestant breakaway was necessary to regain the priesthood and kingship of the individual believer. And it seems to have had a salutory effect on Catholicism at any rate (I do not know enough history of Orthodoxy to know what happened there). The unity God wants between the different streams of christians has got to be something bigger than everyone officially coming under the same organizational roof. I don’t know just what that all means, but I suspect it has something to do with us maturing while still in our various forms into a mature love for God in his three persons, and for our surrounding human beings. I’m looking forward to learning more about Orthodoxy, and experiencing its forms and shared life. The reading of The Bible was not prohibited, but the books were hand-written for a millenia or so and most were not literate, anyway. Also, money was not required for forgiveness. It was a personal sacrifice made to get a loved one out of Purgatory faster. If they’re in there or in that state, they are already going to Heaven. Leadership loses its way at times, but it was no reason to leave it. The Protestant churches have had their share of scandalous behavior, so it really wasn’t worth it. The Jewish leaders also misled during OT times and The people followed suit, causing them to be enslaved or occupied. Eastern religions have had their bad times, as well. Don’t get me started on the irreligious, who think they are better or would do better than any Christians, Jews, or others, but they did way worse last century, alone. Let’s leave the finger pointing out of this. Thank you for your willingness to tackle some of these issues. Allow me to comment on one statement. Your characterization of Evangelicalism as “a loose theological movement that finds its origins in the emotional conversionism of 19th c. revivalism,” is a sweeping generalization. Not all Evangelicals are influenced by the revivalist movement, and many reject the practices of that movement. The roots of Evangelicalism go back to the Protestant Reformation and the “Solas” of the Reformation. Protestantism has been around for 500 years, and the issues that caused the split from Rome were essentially theological and not liturigical, although of course liturgy is informed by theology. Further, Evangelicalism in its broader sense has been around since long before the 19th century, as represented for example by Puritans like John Owen or by later Christians such as Jonathan Edwards, who firmly opposed shallow revivalism. The revivalist movement, which I admit has been influential in some circles, largely abandoned its spiritual heritage and attempted to achieve results more by manipulation of emotion than by relying on the word of God and the Spirit of God. Those are intriguing questions at the end, which as expected, draw mostly from the historicity and patristic argument. I, however, think it’s a stretch to label mid-to-late Antiquity Byzantine Christianity as “the first disciples”. Having worked for over a decade as Protestant pastor in an Orthodox country, let me offer some first hand and hopefully well informed remarks. The assertion that most convert to Orthodoxy because of its intellectual or dogmatic tradition is simply magniloquent. I say this because of two trends. First, Orthodoxy is currently the only Christian segment in which one can be an atheist/agnostic and Orthodox at the same time. Timothy (Kallistos) Ware tells a story where he’s sitting in Jerusalem with a fellow Brit, who’s a Catholic priest, and a Greek doctor. The doctor lashes at Ware and his friend saying, “You can’t be Orthodox because you are English, and you can’t be Catholic because you are also English, both of you should be Anglican. I myself am an atheist, but because I’m Greek I’m Orthodox.” This is humorous but it’s more of a current trend than Evangelicals converting to Orthodoxy. 20% of Russians who say they are Orthodox today claim they don’t believe in God. In my host nation, while 92% claim to be Orthodox, but only 75% say they believe in God, and that’s by using the broadest definition of “belief in God”, since only 56% say they believe in the Trinity. The rise of the “atheist Orthodox” is more of a trend than the conversion of some Evangelicals to Eastern Orthodoxy. This growing trend is far from dogmatic. Secondly, most Westerners who convert to Orthodoxy do so through marriage or by other cultural impetus. They have fallen in love with an Orthodox spouse who nudges them into Orthodoxy in order to have an Orthodox wedding. Since the Church won’t marry a non-Orthodox, the conclusion is simple. But that’s cultural appropriation, not conversion. There are cases, such as with Hanegraaff, where the conversion to Orthodoxy is caused by a disenchantment with Protestantism/Evangelicalism. I feel the term “disenchantment” more accurately describes this type of angst and abandonment. Eastern Orthodoxy is highly enchanted, with some traditions blurring the lines between mystery and superstition. It’s folkloric at times, even though Florovsky and St Vladimir are intellectually challenging in their own special way. Another overlooked fact from both Stetzer’s piece and this one, which refers to questions 7 and 8 of your conclusion, is that Hanegraaff was explicit when he said he was converting to “Greek” Orthodoxy. The fact he’s not converting to “Pan-Orthodoxy” or into any of the 4 ancient Patriarchates, which in light of current episcopal issues, will have me be cautiously optimistic as to the reason he felt the need to reinforce a particular Orthodox jurisdiction. In that same breath, one does not know yet what Greek name he chose to take on. Going forward, I advise caution as to what his contribution will be to Pan-Orthodoxy as a Greek Orthodox. I think you misunderstand what I wrote. The claim that Orthodoxy is appealing mainly to intellectuals was Stetzer’s, not mine. As for those who can identify with a religion and yet be atheist, that is possible for any religion and more frequent in places where one religion tends to be predominant. I’ve met folks here in the US who identify as Catholic or Lutheran, for instance, who also may say they’re atheist or agnostic. I even once meet a Turkish man who identified as both Muslim and atheist. The commonality is when people regard religion as roughly equal to tribe or culture. That’s not a weakness of the religion, however (usually; there are religions that explicitly teach being born into them and not being able to convert), but is a distortion. This has not been my experience in the United States. I am a chrismate, not a cradle orthodox, so I only know a few priests. However, I can tell you that the priests that I know will not baptize or chrismate someone whose sole motivation is to get married in the church. This is for two reasons. First, the church does NOT require both to be orthodox to have the Greek Orthodox marriage. The second is, in the Greek church anyway, the priest has to get to know the person before he will accept the request. As to the being Orthodox and atheist, that is hardly unique. According several evangelical pastors to whom I regularly listen, poles of evangelical pastors show a surprising number do not accept the virgin birth of Christ or the Resurrection. Depending on the church’s affiliation, they may not be accountable to any hierarchy. Imagine what they are teaching their flocks. Thank you, Father, for this clarification of the issues. I’m a Wheaton College graduate, but I’ve been Orthodox for 23 years and am continually discovering that evangelicals’ groping toward faith and spirituality find a fulfillment in the Holy Orthodox Church. I thank God for my Protestant upbringing! My faithful parents, aunt and uncle and brother who were Seminary trained, Wycliffe Missionaries and in YYAM. Why become Orthodox with such a full Protestant life? I experienced the shift from God centered worship to me centered worship that began somewhere in the 60’s onward. I left Protestantism for Orthodoxy because the center of everything wasn’t me but God! The Holy Trinity is worshipped reguardless of my comfort or taste or desire. The Liturgy is the same and unchanging. What I longed for I found. I longed for Christ. Thank you, Fr Andrew Stephen!! !